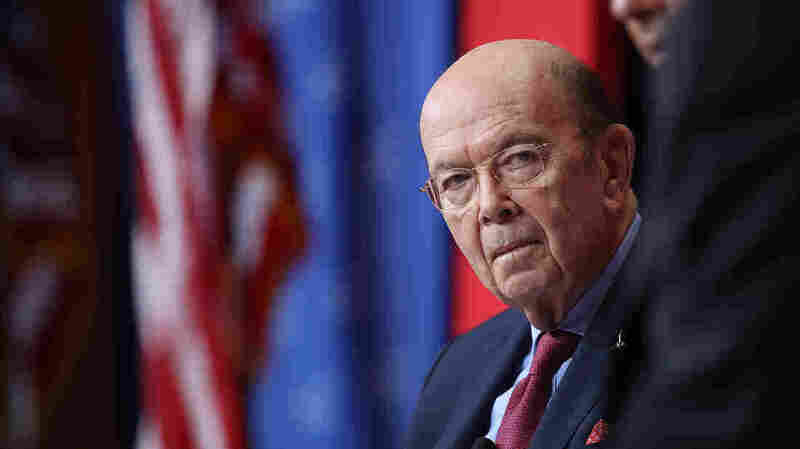 Commerce Secretary To Testify At Hearing On 2020 Census Citizenship Question The commerce secretary has agreed to be questioned by lawmakers on March 14, after a federal judge ruled that his decision to add a citizenship question to the 2020 census was based on "sham" reasons. Commerce Secretary Wilbur Ross, who oversees the Census Bureau, has agreed to testify at a House oversight committee hearing in March about the citizenship question he approved adding to the 2020 census. Commerce Secretary Wilbur Ross has agreed to come before lawmakers again to testify about his controversial decision last year to add a citizenship question to the 2020 census. Ross, who oversees the Census Bureau, is set to appear at a March 14 hearing on Capitol Hill before the House Committee on Oversight and Reform, the committee's chairman, Rep. Elijah Cummings, D-Md., announced Tuesday. "Committee Members expect Secretary Ross to provide complete and truthful answers to a wide range of questions, including questions regarding the ongoing preparations for the census, the addition of a citizenship question, and other topics," Cummings said in a written statement. "The Committee also expects full compliance with all of our outstanding document requests prior to the hearing." The announcement comes a week after a federal judge in New York ruled that Ross "violated the public trust" by misusing his authority over the census to add a question about U.S. citizenship status based on the "sham justification" of better enforcement of the Voting Rights Act. The Trump administration is appealing the ruling for the two lead lawsuits in New York, while continuing to fight in other district courts similar lawsuits filed by dozens of states, cities and other groups that also want the question removed from forms for the upcoming head count. The plaintiffs are concerned that in the current political climate, using the 2020 census to ask "Is this person a citizen of the United States?" will depress participation among households with noncitizens, including unauthorized immigrants. That would risk the accuracy of population counts used to determine how congressional seats and Electoral College votes, as well as federal funding, are distributed among the states for the next decade. "Voluntarily and without a subpoena"
NPR is reaching out to the Commerce Department's Office of Public Affairs for comment about the hearing and will update accordingly. Attorneys for the lawsuits' plaintiffs are expected to watch Ross' upcoming testimony closely for any statements that could be used against the administration in this legal battle, which is likely to reach the Supreme Court. According to Cummings' statement, Ross agreed to testify "voluntarily and without a subpoena" after "several weeks of discussions." Cummings' staff first reached out to the Commerce Department about the hearing on Dec. 20, according to the committee's press office. In the courts, however, the administration has fought hard to prevent Ross from having to sit for questioning under oath for the citizenship question lawsuits. In September, U.S. District Judge Jesse Furman ordered the administration to make Ross available for questioning by the plaintiffs' attorneys. Furman noted that Ross' "intent and credibility are directly at issue." The Justice Department eventually appealed that order to the Supreme Court, arguing that allowing the plaintiffs "to probe the Secretary's mental processes" was not necessary to resolve the cases. After temporarily blocking Ross' deposition, the justices recently canceled plans to weigh in on the dispute. Still, some Democrats in Congress have been eager to question Ross again about the citizenship question. Last year, Ross testified on Capitol Hill that the Justice Department "initiated" the request for the question. But as Furman concluded in his opinion, internal emails, memos and other documents released as part of the lawsuits show that Ross' testimony was "materially inaccurate." Shortly after his confirmation as commerce secretary, Ross began pushing for a citizenship question to be added to the 2020 census, and his staff approached the Justice Department about requesting the question. In October, Rep. Grace Meng, D-N.Y., a member of the House Appropriations subcommittee that funds the census, called for the Justice Department to investigate whether Ross provided false statements during a congressional hearing last March. "Has the president or anyone in the White House discussed with you or anyone on your team about adding the citizenship question?" Meng asked Ross during the hearing. "I am not aware of any such," Ross replied. The administration's attorneys revealed months later in a court filing that Ross did discuss the issue with former White House chief strategist Steve Bannon. A Commerce Department spokesperson, Kevin Manning, tried to downplay Ross' exchange with Meng, arguing that Ross was "responding to a question about an RNC campaign email, not a direct question about the citizenship question." Meng did not accept that explanation, tweeting in October: "Unconscionable that @SecretaryRoss lied to my face during a Congressional hearing on the issue."